This modern crochet granny blanket is a series of triangles nestled in between each other which gives the blanket a modern feel. This blanket works up fast and is fun to memorize and pick up easily where you left off. Gauge: not necessary, just do a base chain in a multiple of 3 + 1 to any desired length. CH a multiple of 3 then add 1 (3+ 1 is the pattern repeat) to however wide you’d like the blanket. I usually do somewhere between 32 and 36 inches wide for a baby blanket. ROW 2: CH 3, 1 DC into next DC, (CH 3 counts as first DC), *CH 2, DC3TOG, repeat * ending with CH 2, DC into next DC, DC into top of turning chain, pulling through with new color just before you finish the DC. ROW 3: CH 3, 3 DC in the CH 2 space between the last DC3TOG and 2 DC of the previous row, *3 DC into next CH 2 space, repeat * ending with 1 DC in top of the turning chain. ROW 4: CH 4, (counts as 1 DC and 1 CH), *DC3TOG in top of each 3 DC of previous row, CH 2, repeat * across and end with CH 1, DC into top of CH 3 turning chain, pulling through with new color. ROW 5: CH 3, 1 DC into DC (the base of the ch 3, the top of the last DC you made), *3 DC in next CH 2 space, repeat * across ending with 2 DC into the top of 3rd chain of the turning chain. ROW 6: CH 3, 1 DC into the next DC, *CH 2, dc3tog, repeat * ending with CH 2, DC into next DC, DC into 3rd of ch 3 pulling through with new color just before you finish the stitch. Repeat rows 3-6 until you have a desired length of blanket. 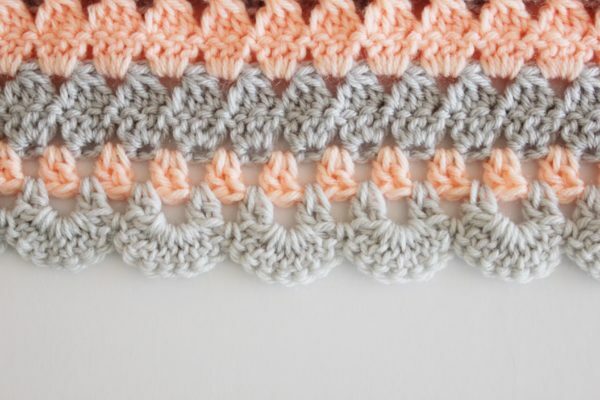 Here are a few tips I realized while making this blanket that might be helpful to you. Since each finished “triangle” (the DC that stack on each other) are nestled in between each other, you will notice that the number of them will be different each color change. For example, I did a small swatch to test the pattern and I ended up with 8 “triangles in one row, then 9 in the next, then back to 8 then back to 9. What I noticed are the rows that have 8 are also the rows where you have 2 DC and the end of the rows. The rows that had 9 “triangles” only had 1 DC on the end. Now, it might be the yarn I was using, my own personal tension, and yours may be different, but I did have to work a ch in between the 2 DC across the top and bottom. The sides did not need that extra chain. I tried doing it without, because I wanted the stitch to match the sides, but it pulled and puckered. This to me is when you get to be smarter than the pattern. It’s much better to work an extra stitch and have it look right, than get your counts exact. Again, you might not have this problem. Continuing on in the same direction for the second round, join with the new color (flannel) and slip stitch one over and CH 3. (This gives the appearance of the first dc into the chain space. Then work one DC into the chain space. CH 2 and work 2 DC into the next space. Repeat this all the way around the blanket, working 2 sets into each corner. When you return back to the original CH 3, slip stitch into the top of that. Chain 3 and turn your work to go the opposite direction. I hope you are in a corner for this CH 3 is the middle of the shell. DC 4 more times into that space and then SC into the next chain space. You want to work 7 DC into the next chain space, then one SC into the next chain space and repeat this all the way around. However, because I had problems on the sides being closer together than the top and bottom, I only worked 6 DC. I found that working 6 showed no difference, but if I worked 7, the side shells were rippling. Again, this might not happen to you at all. When you return to the corner you started with, work the remaining 3 DC and then slip stitch to the top of the turning chain. Tie off and weave in ends and you are done. For the corners, I was able to work a complete 7 DC into each. But, for a crocheter like me who doesn’t like to count, (I know, shhh don’t tell) I felt so lucky that it just so happened to turn out that way. (sometimes my one SC turns out to be the corner stitch and it looks okay, just not my favorite.) If you are better at math than me and want to make sure you are working the shell into each corner, you may want to add more rounds of 2 DC until you find you are exactly even. Also, if that last part confused the heck out of you, don’t do it! I almost just left the border to be the rounds of 2 DC. I thought it looked good sort of plain. But this is a gift and I decided to make it a little extra frilly. And, just working all SC around this blanket, switching colors would look great too! Good luck! 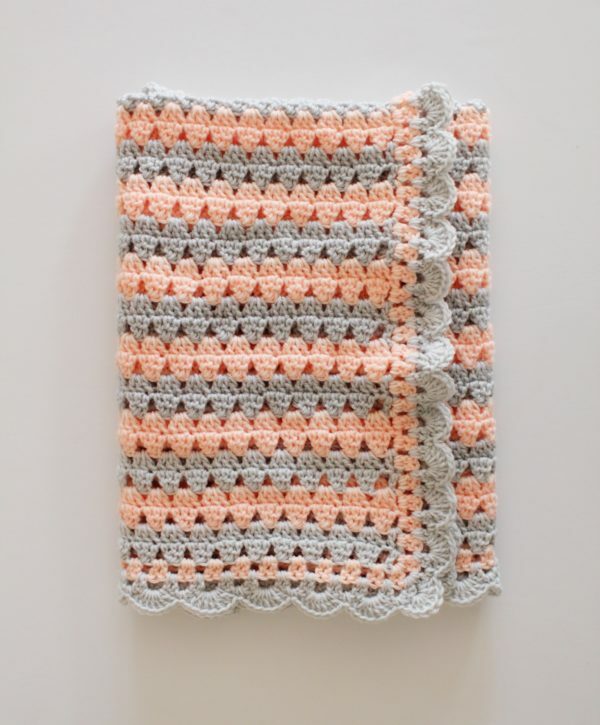 Click here to see another version of this modern crochet granny blanket in peach and blue! Also, I’d love to invite you to join up on Instagram. A lot of people use the #crochetersofinstagram hashtag and it’s so inspiring to see all the different work. I’m @daisyfarmcrafts if you decide to join! I also have a Facebook page, a Pinterest page, a Twitter account, a YouTube channel all named Daisy Farm Crafts. Whichever way is the best for you, I’d love to hear from you!